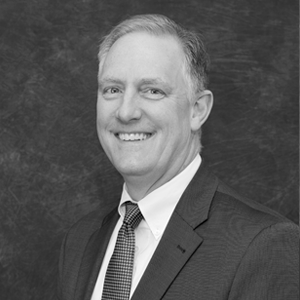 For more than 15 years, Kay has been a leader in Michigan real estate law, as well as elder law, estate planning, and probate and trust administration. During this time, not only has she served her clients at an exceptional level but has also worked to help make Southwest Michigan a better place to live and work. A member of the firm’s management team, Kay is in charge of the firm’s Battle Creek office. She dedicates much of her successful real estate practice to residential and commercial transactions, including municipal planning and zoning matters, and concentrates in transfers of property ownership, solving complex title defects, condominium law, title litigation, real estate development, and the laws that govern homeowners’ associations. Kay also maintains a busy estate planning practice. She is a forceful advocate for her clients, many of whom are seniors in their retirement years who rely on her to assess their long-term care planning needs, including the complicated and ever-changing area of Medicaid benefits. Kay counsels clients and their families on the appropriate estate planning tools (trusts, wills, deeds, powers of attorney) for succession planning and asset protection, making sure her clients’ best interests are always at the forefront. She is a longstanding member of the West Michigan Forms Committee of the Grand Rapids Association of Realtors, a group comprised of participants from several Realtor Associations throughout West Michigan and for which she serves as chairperson. In 2017, Kay was appointed to the Advisory Council of the Women’s Leadership Institute at Olivet College, where she is part of an elite group that seeks to empower young women entering the labor market. The WLI is committed to making a positive impact on students, particularly female students who want to enrich their workplace skills and talents. As part of her service on the Advisory Council, Kay is involved in a program called “Cultivating Women Leaders,” an interactive workshop for high school students, as well as Olivet College students, faculty, staff, and alumnae. Another example of Kay’s community involvement is her participation in local Big Brothers Big Sisters activities. Kay’s former little sister, Abby, is especially grateful for Kay’s support and encouragement over the years. Their story of devotion and friendship was recounted in“It’s Life Changing,” an article prominently featured on the Big Brothers Big Sisters of Southwest Michigan website. The article talks about their journey as “Big and Little” over the years, how their relationship grew, and how they learned life experiences from each other. The Big Sister experience has been life-changing for both Kay and Abby. We are immensely proud of Kay and honored to have her among the Kreis Enderle family. 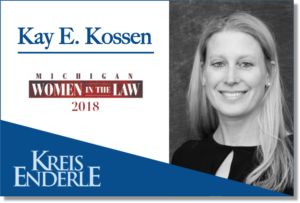 Please join us in congratulating her on her “Women in the Law” award!